Let these gummy bears bring joy to the most special place in the world, YOUR HOME! Great for making sweet treats like gummy bear candies, chocolates, mints, fudge etc, you name it! -53 cavities of each tray. Cavity size: 0.4" x 0.7" x 0.4"
The NEWEST 3 pack x 53 gummy bears, over 150 yummy gummy bears pop out at a time with detailed face, cute snout, cuddly arms and lovely paws! Comes with 3 bonus droppers make filling much more easier than before. 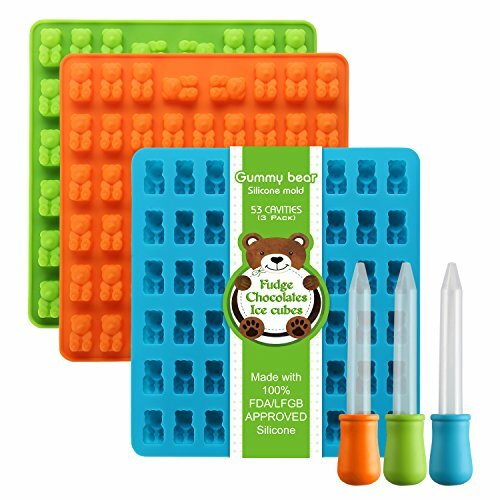 Feel freely making gummy bear candies, mints, fudge, chocolates, ice cubes or whatever you want with these gummy bear molds! You can add Vitamins in or create your own receipt. Just stay creative! 100% food grade silicone, non-stick, FDA approved, BPA free. Oven, freezer and dishwasher safe. Heat resistant up to -40F to 450F. Size: each tray is 6" x 6-1/2". each cavity is 0.4" x 0.7" x 0.4". Includes: 3pcs silicone gummy bear molds (blue, green, orange), 3 droppers.